In October 2002 a group of 25 Bristol enthusiasts went on a trip to Belgium and Holland organised by John Woodhams. 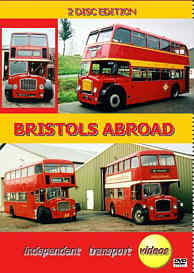 Our cameras went along as well to record the sightings of many former UK buses, mainly of Bristol manufacture. The party travelled from Antwerp on board former Pontypridd UDC Bristol L6G to THE LONDON CEREMONY BUS company at Kappellen, home to a KSW, FLF a VRT and many others. Just along from here is ASPEKT MOBIEL, where an ex. Crosville FLF now resides. The trip back to Antwerp was on a former United Counties lowbridge KSW. The first stop in Holland was at BART PRINS CLASSIC BUSES. Here there was an interesting collection of FLFs and an ex. Eastern National KSW open topper. The trip to PETER VERBEEK at Veen was made on 428 PTA a Bristol FLF - now 6LX from the Southern National fleet. Here we were treated to the delights of an FSF, FS, KSW and an interesting conversion of an Eastern Counties FLF! PIET VAN DE MERWE of Dordrecht was PTA’s next destination. The oldest surviving Lodekka in the world is here! Former DX2 (MWR 618) of the West Yorkshire fleet, one of the six pre-production Lodekkas built in 1953. It is seen here in excellent condition sharing a shed with two FLFs and another LD. A refreshing visit was made to the HEINEKEN BREWERY at Leiden by yet another FLF! Not just for the beer, but for two ex. Southern Vectis LD6Gs from 1954/5, both of which have lived in Holland longer than on the Isle of Wight! MART LEEK at Monnickendam has a collection of L, LS, LD, and FLFs - we travelled there on a superb AEC Regal IV with Burlingham Seagull bodywork. DELTA TOURS at Wapenveld is our final stop in Holland where we were treated to the delights of FLFs, a KS and an FS5G. As a postscript to this BRISTOLS ABROAD video the itv cameras found two FLFs in the Caribbean on Antigua, one is ex.Southern Vectis 612, sister to 611, a regular performer on some of our Isle of Wight subject videos! So if you are a Bristol fan, this is the video for you. Re-live the sights and sounds of these superb vehicles. Duration : 128 minutes (approx).